Get YOUR Log Home Christmas Ready! ← Could A Smaller Cabin Be Better For You? Log cabins are very popular vacation spots, especially during the Christmas season. Whether your log cabin is in the woods or near your main home, sprucing it up and getting it ready for the holidays both feels and looks truly wonderful! I hope you’re ready to get into the spirit! In this article, we will share valuable tips on how you can transform your log cabin into a spectacular venue this holiday season. Give your family and loved ones a treat this Christmas and make memories that will forever be cherished. If you end up doing nothing, you’re going to regret not taking that chance. So how do you get your log cabin ready for the holiday season? While it’s recommended you treat the timber of your log cabin at least once every two years, give it a good clean and shine will make a whole lot of difference. Varnish and stain it to keep it safe from the harsh winter climate, and looking its absolute best. You can either get a professional to do it or if you are up to it, do it yourself. It normally takes about 24 hours for the varnish to dry but winter and rain can make this impossible. You should start now so that it’s you can be totally sure you’ll be ready in time for Christmas and such! The end of November, after thanksgiving is when most people tend to start decorating, and a good time for you to do the same. Insulation is crucial in winter, it’s important that you keep as much heat in and cold out as possible. You should ideally have your windows double glazed, as this further prevents heat loss. The roof should also be insulated using fiberglass because most of the heat is lost from the roof. Make sure the fireplace is clean and ready for use because you’ll need to keep your family and guests warm during the holiday season. And who doesn’t enjoy a nice fire in the winter?! Over time, your log cabin’s gutters and roof will get clogged with small branches and leaves. These should be cleaned out before winter arrives because cleaning a frozen gutter is all but impossible. You should have a professional do it so that they can also make any needed repairs that they come across. Clean roofs and gutters mean that you will not be inconvenienced by leaks while you entertain in your log cabin during Christmas. A new cast iron wood stove burning hot with slate tile. Open fires are popular in log cabins but today, most people have installed heating systems also just due to the sheer amount of cold that some winters can bring. Stock up on your log supply beforehand and ensure it’s properly split and dry. In addition, get a professional to service your heating system so that it is fully functional when you need it the most. Nothing could be worse than buckling down for a winter storm only to find out your heat has just stopped working! If you only use your log cabin on occasion, it will probably be dusty and full of dirt and grime. Washing it periodically and letting it air out is good so that by the time Christmas comes, you have minimal cleaning left to do and your friends and family can enjoy the space without the discomfort of musky smells and accumulated dust that could induce allergies.We not only provide state of the art log cabins to our clientele, but we also offer maintenance and cleaning services at a very affordable cost. Contact us today and we will have your log cabin ready for Christmas in no time. For more information on building a log home contact Log Home Builders at 919-202-4428. This entry was posted in Log Home Tips and tagged log cabin, Log Home Builders, log homes, maintaining a log home, winter cabin care, winterize. Bookmark the permalink. Thank you for the superb work that you & your crew did on our dream log home. We have had a fantastic experience. Learn from my mistakes...buy your logs from the man that is going to put them up. Let Quality do it all! [They] built my dream log cabin back in 2003. I was very pleased with the quality of work and service I received. They handled everything from start to finish. They are very knowledgeable and capable of handling anything you need. Let Quality do it all -- your experience will be a dream. Your professionalism & attention to detail has assured us that our log home will be around for a long time to come. 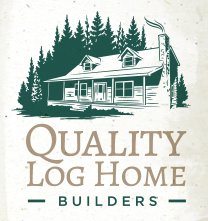 Interested in full turnkey packages,Log Cabin Kits, prefab log homes, modular log homes, a little help in construction, or even just DIY logs for YOUR new home? We provide delivery/service throughout Eastern and Central NC! © 2019 Quality Log Home Builders. All Rights Reserved.